If you’re fighting a battle against dark marks, uneven skin tone or rough skin then I’m pretty sure you’re aware that none of the above, are easy battles to win. However, the guys over POND’S believes that their Flawless Radiance range, together with POND’S GenActiv™ COVER technology, is going to diminish dark marks and give you an even, more brighter skin tone! 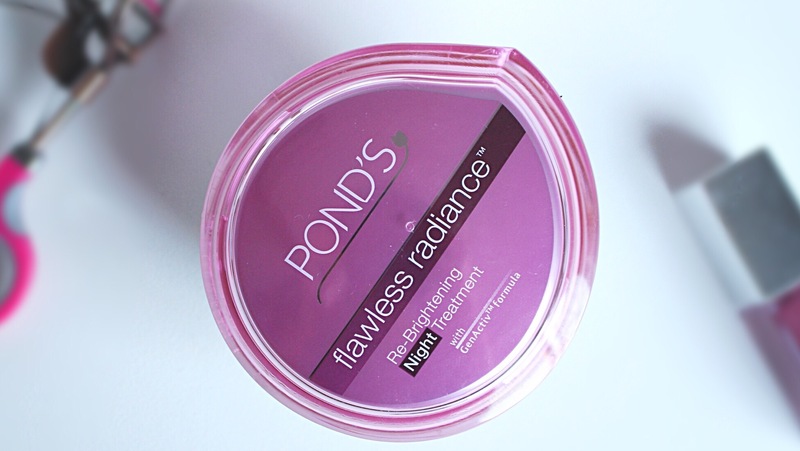 I tried out the POND’S Flawless Radiance Day Cream, Night Cream and the BB cream and here are my thoughts.. 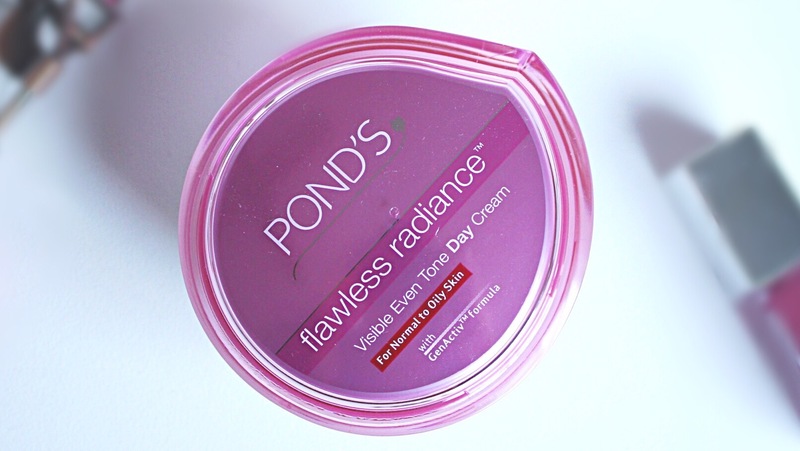 I don’t have particularly oily skin – but I do tend to get oily around my t-zone halfway throughout the day and the POND’S Flawless Radiance Day Cream really helps to keep oil at bay. During my test-and-review period of this range, I used the day cream as a sub for my primer and it really did a wonderful job in keeping my skin moisturized and my foundation in place. I absolutely love this texture of this product. It’s super silky and just feels so luxurious on your skin. 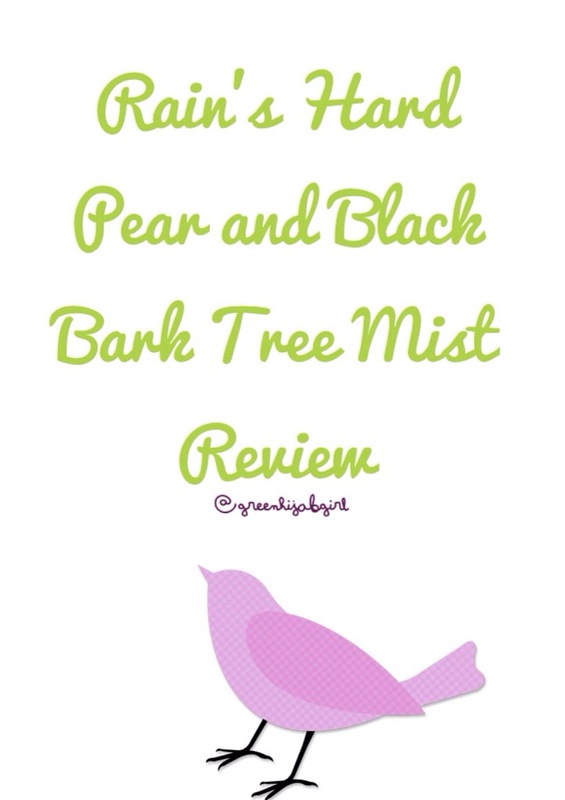 It’s a nifty product to add moisture back into the skin! And now, on to my favorites..
What I love about these BB’s, besides being so affordable, is that it’s very light on the skin but it still manages to cover up the necessary marks and blemishes. The BB cream also serves a dual purpose of evening out the skin tone whilst covering marks and providing sun protection. When applying you literally need the tiniest amount. Like, a dot of this BB covers my entire nose – no kidding! And using less, means a longer lasting product which means it saves money too! If you’d like, you can purchase both the beige and chocolate shade and use them for highlighting and contouring your nose, cheeks and jawbones. Definitely a product worth purchasing! 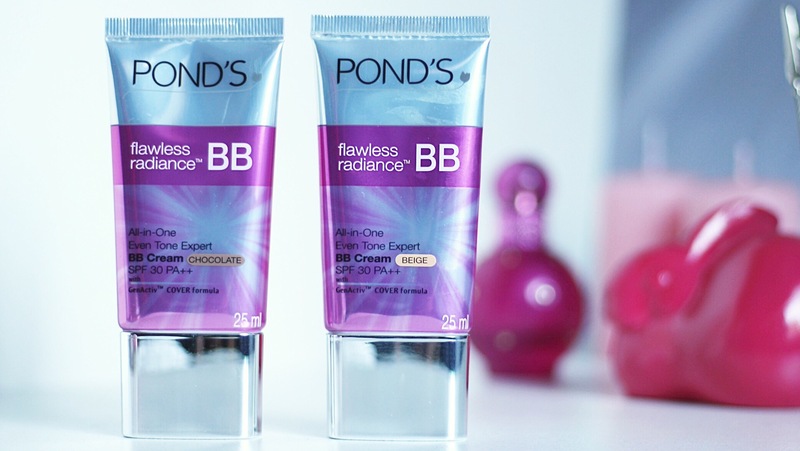 Overall, I absolutely am loving the POND’S Flawless Radiance Range and would definitely recommend that you guys try it out! Yup, I can finally confirm that this week is officially ‘Vaseline Week‘ on Veiled Beauty. With a male beauty product review today, the giveaway going live yesterday and of course, a little bit more about the great things that the Vaseline + Direct Relief Healing Project is achieving, tomorrow – so I really hope you guys do enjoy! 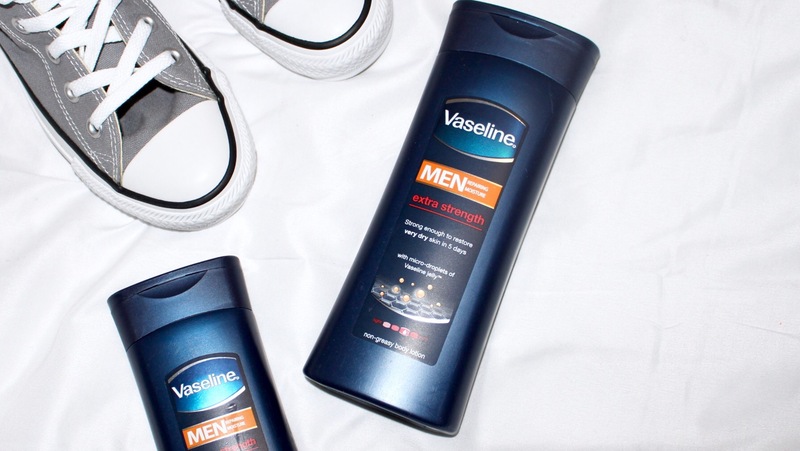 Now on to the review..
A few weeks ago, I received a little package from Vaseline containing their MENbody Extra Strength Lotion, for Sohail (read more about our male beauty reviewer here), to try out for 5 days and then share his results with you guys! The Vaseline MENbody Extra Strength Lotion is a fast absorbing and non-greasy lotion formulated to deeply moisturize and relieve very dry skin and is infused with micro-droplets of Vaseline BLUESEAL Jelly that assists in restoring dry and damaged skin. Stronger, smoother and more restored skin is what this lotion aims to achieve to make your other half a Man of Extra Strength. “Honestly, before using the Vaseline lotion my body was extremely dry as well as itchy (mostly because I’m guilty of depriving my skin of lotion and moisturizer) and considering that I have been only using the lotion for about a week now, the results really are fantastic. I’ve been using the product every morning and evening and my skin feels so much smoother, it’s not dry and neither does it itch anymore. I’ve noticed a major change particularly around the elbow and knee area which can tend to get extremely dry, these areas are now really soft and smooth. I particularly loved how moisturizing the lotion was and the fact that it absorbed easily into my skin once applied. I also really enjoyed the fragrance of the product, it wasn’t too overwhelming like fragrances of other lotions tend to be and the easiness of getting the product out of the bottle was really a plus – there was no wastage of product or time. Don’t forget to enter the Vaseline giveaway on the blog here! So, as always, I’m having issues with my email – I think it’s time to change over to a new host? Anyway, if you guys tried contacting me and the email bounced back – please email me on accessorae@gmail.com! I’m not sure when this issue will be sorted out, but I definitely will let you know when it has been! Apologies for all the trouble. I realize that I’ve been uber busy recently and haven’t really had the chance to update my blog regularly i.e. at least once a week, so I figured that it’s time for me to up my (blog) game and be a more frequent blogger. 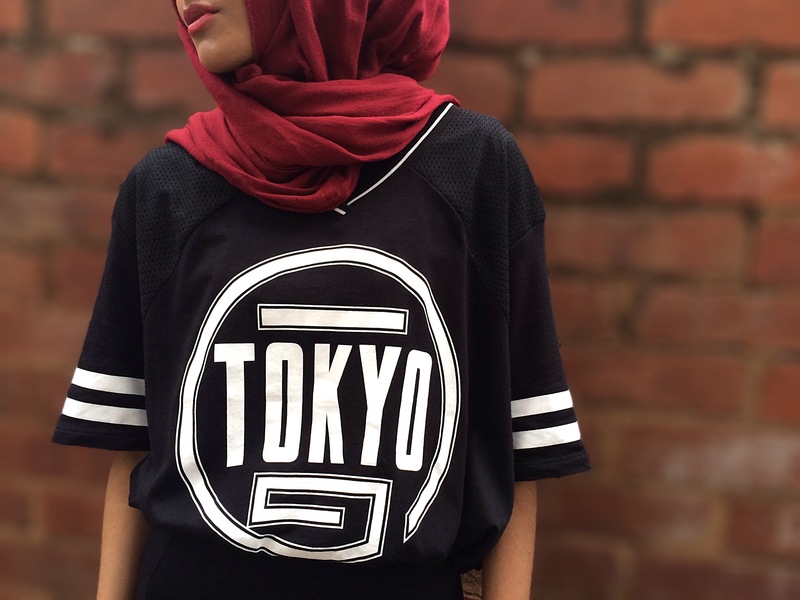 With that said, from tomorrow onwards, you can look forward to a new post on Veiled Beauty every weekday at 6am! That way you can get your daily dose of either beauty reviews, OOTD inspo, fashion news or general tips, tricks and DIY instead of waiting 2 weeks for a new post. Black and white is one of my fav colour combos. I love that I can pair it with any other solid colour and it will just work perfectly. 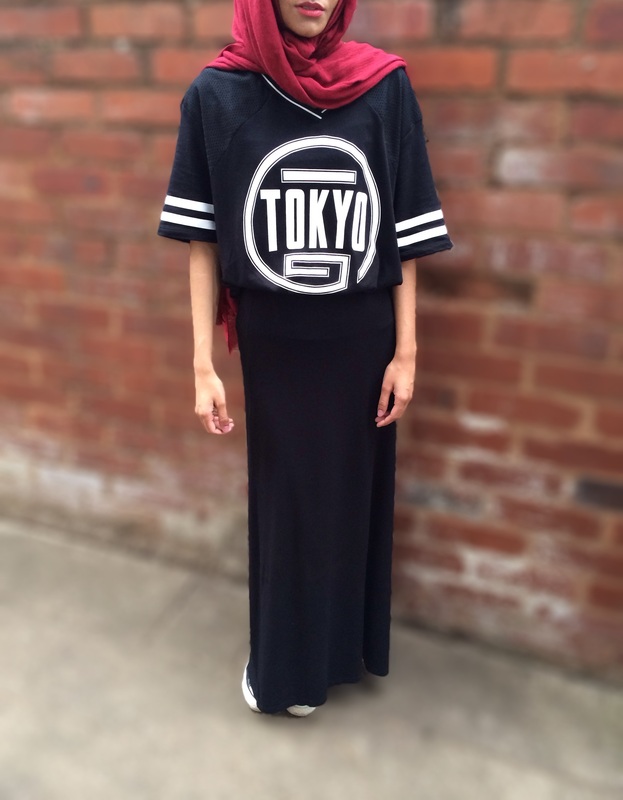 For this look, I paired a straight, banded maxi skirt with what looks like a tee but is actually a crop top. The crop top is a size 42 (I kid you not) which is what allows it to look like a tee on me. 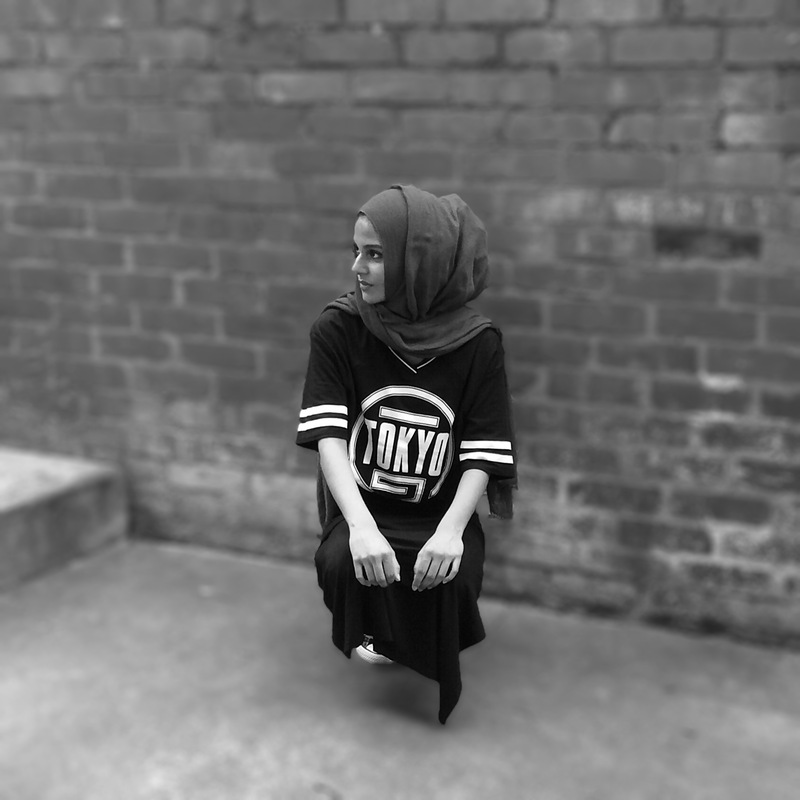 I don’t think there’s anything wrong with buying an item in a size that’s much, much bigger than your own – as long as you style it in such a way that it looks like it was made for you. 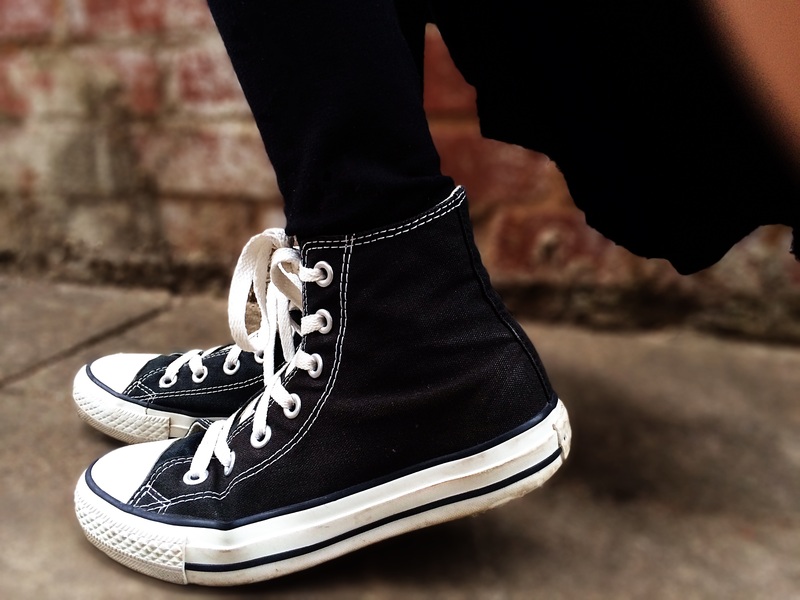 For my shoes, I opted for my trusty black Converse Chuck Taylor’s. 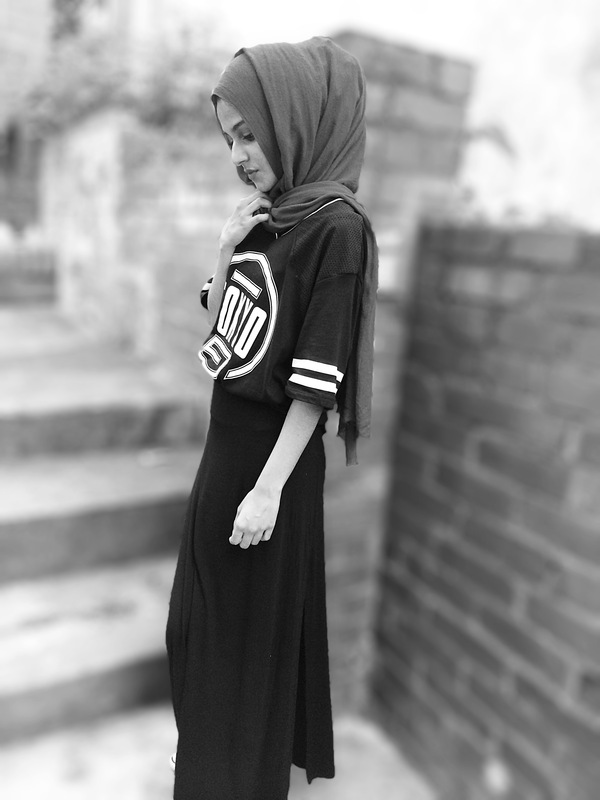 I love pairing sneakers with maxi skirts/dresses, I think it’s really fun and unexpected and adds an element of sporty chic to your look. My scarf is a wonderful shade of oxblood and is definitely one of the softest scarves I own. It drapes perfectly as you can see and sits quite well on my little noggin. I just pinned it under my chin, and created the midfold by bringing forward and pinning down some of the fabric and then I criss-crossed the scarf and threw it over my shoulders. The extra volume in my scarf is all thanks to the volumizing scrunchie from Damasq (you can read more about it here). To me, I feel that the back of my head looks a little too big, but I think it’s to due to extra fabric of the scarf that hasn’t been pinned down – you know, maxi scarves! 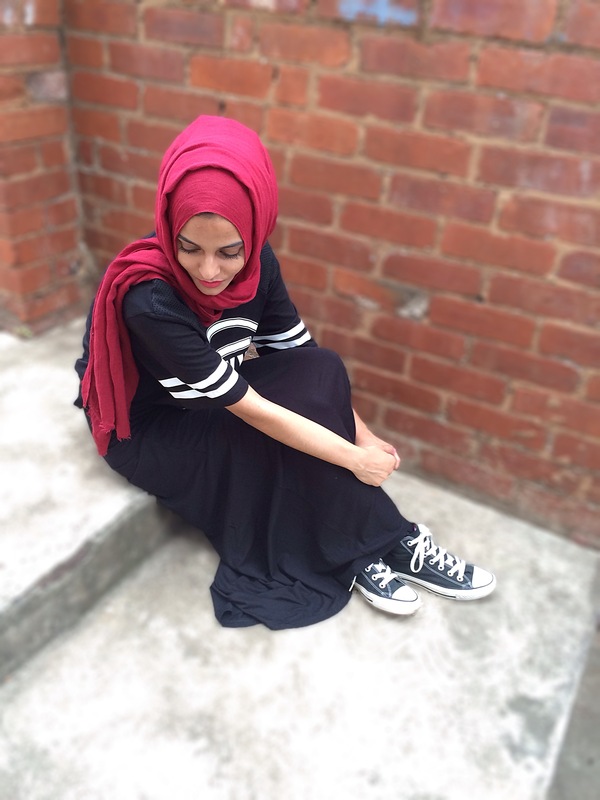 And finally, I decided to skip all accessories for this OOTD, mostly because I’m just lazy and partially because I didn’t think it needed anything more!